In the days before modern video camera technology, plumbing companies had to use a trial-and-error approach to resolving plumbing issues. After listening carefully to the property owner, the plumber would attempt to snake the drain, or even hydro-jet it. In most cases, these techniques would clear the clog. After clearing the clog, the owner paid him for his work, and he would head off to his next assignment. But some problems cannot be fixed by simply clearing a clog. In cases where a pipe has been breached, the line is at risk of collapsing. Cracked and collapsed pipes do not get better when ignored. In such cases, paying a plumber to remove a clog does more harm than good, because the symptoms have been treated, while the problem grows worse. Without a way to inspect the pipe, there is no way to tell whether the plumber had finished the job. Without a camera, it is impossible to tell exactly what has happened to a pipe without digging it up. A plumber may be able to get sewage to drain if the sewer has backed up. But there is no way to know whether he has fixed the problem for good. This puts the plumber in an awkward position when he asks the owner for permission to dig up the sewer line. The line is damaged, and he doesn’t dig it up, then problems will continue to arise. If the line is not damaged, and the plumber does dig it up, then he will have charged the owner a lot of money for nothing. Digging up pipes is expensive, especially when they are inside the foundation. To avoid this, the plumbing industry has evolved to make use of fiber optic video inspection cameras. These snake-like cameras worm their way down into a drain or sewer line, enabling the plumbing professional to examine the pipes from the inside. It has become standard practice on any size job, because it is the best way to ensure that the job is finished, and that there are no additional problems lurking on the horizon. 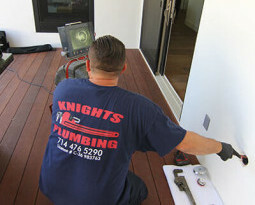 Knights Plumbing has the very best video inspection cameras available, and all of our professionals are trained and certified by their manufacturers for their proper use. 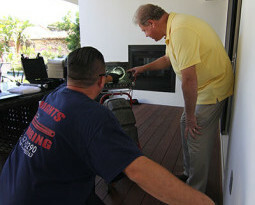 When we arrive at your home to help you resolve your plumbing issue, the first thing we do is inspect your plumbing infrastructure with our video inspection equipment. With you by our side, we will show you on our monitor the exact nature and scope of your plumbing issue, and give you a flat-rate quote for fixing it. With our video cameras, we can identify debris, roots, mud, pipes that are off-center or collapsed, cracks, holes, corrosion, or leaks. If your pipe is old, damaged, or breached, we can provide several options for fixing the problem. And we will give you a flat rate quote on each one, so you can feel good about the choice you are making. When we inspect your pipes with our cameras, we’re pinpointing the cause of your problem. When you can match the cause of your problem to its symptoms, you can rest easy knowing that once it’s fixed, the problem will not return. And you can also rest easy knowing that the price that we quote you will not change, because we are just as confident of the solution as you are! Video inspection doesn’t merely help you by avoiding an expensive dig to find the problem. It also may help you to avoid digging completely! Many of our modern solutions to plumbing issues can be implemented without having to dig up your sewer system at all. We use a variety of tools to access clogs and clear them. And if your pipe is damaged, we can often repair and seal it from the inside, using our high quality resin. We’ve saved countless homes and businesses the unnecessary expense of digging up their sewer lines by using this procedure. If you are going to call one plumbing company to perform all of these services for you, you want a company with professionals who are properly trained. At Knights Plumbing, we are certified on our video inspection tools, but we are also certified on all the equipment needed to fix your problem, permanently. When you call us, you can be certain that we will give you the best service available. From time to time, the buyer or seller of a home or business will call us requesting a thorough video analysis of the building’s plumbing infrastructure. When they call us, we will report to the site, and use our camera to explore the pipes and drains of their building. Often during the sale of a building, such inspection is necessary to assess the building’s value, or to determine the urgency of needed repairs. If you have such a need for home inspection, Knights Plumbing is the company you want to call. We are very familiar with all of the legal paperwork and process required to establish the current state of a building’s plumbing system. We will remit this paperwork to a realtor at your request, and even provide video footage for any interested parties. Having done this for many years, Knights Plumbing has established itself as a premier source of inspection data for all of Orange County. In many cases, the client requesting our services will hire us to fix any problems we find in our inspection. We often do this immediately, while still on site. We provide flat rates for our services, and because we already know the problem from performing the inspection, we can give the client an accurate quote on the spot. Being trained professionals, we have the equipment needed to fix the problem. And nobody wants to see a transaction held up over a matter that is easy to fix. After repairs are complete, we then re-do the inspection, thus providing the client with the timely information he or she needs to complete the transaction. 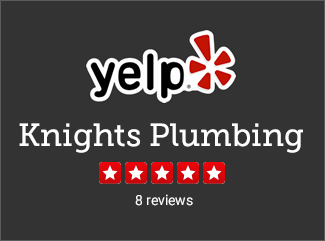 Knights Plumbing is conveniently located in the heart of Orange County. We are available 24 hours a day, 7 days a week. Call our office for a free quote on your needed service, and we are happy to help you. Our plumbing professionals are well-groomed, respectable, and hard-working. We have to be, because we’re working for you.